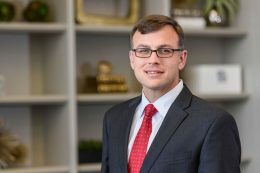 Todd A. Jones is an attorney and founding partner with Anderson Jones who has extensive experience in construction law and litigation, collections, OSHA defense, contracts, local government and municipal law, administrative law and litigation, real estate, employment law, immigration law, and traffic violations. He is licensed to practice law in North Carolina and in the District of Columbia, as well as in the federal courts system and before the U.S. Supreme Court. He has handled cases ranging from workers’ compensation to personal injury to multi-million-dollar contract disputes. Todd is an active volunteer with the North Carolina Bar Association’s Construction Law Section. In 2007, he received the Blanchard Outstanding Young Lawyers Award by the association for his work on law-related education for North Carolina schoolchildren ranging from elementary school to high school. He has served as a member of the Downtown Housing Improvement Corp. (DHIC) for six years and currently serves as the organization’s chairman of the board. Additionally, he serves on the Construction Financial Managers Association’s National Government Affairs Committee, on the Association of Builders and Contractors’ Fayetteville Council and serves as the chair of the Campbell Law Alumni Association Board of Directors. He is also a frequent speaker at association and conference meetings on a national level. In May of 2012, Todd traveled with the International Section’s delegation to Lithuania and Latvia and represented North Carolina lawyers internationally, facilitating the Attorney Exchange Program between the Lithuanian Lawyers Association and the North Carolina Bar Association, which in early 2013 hosted the Lithuanian contingent for its inaugural visit to North Carolina.